We had a family tradition to come to this park on Father’s day, and it was always a nice spot to look for people just having fun. In this case, I was working for a newspaper in Tacoma, and was shooting what we called “feature” shots, and found myself drawn to that park. I saw a father teaching his daughter how to roller skate – with these huge hurking skates that just really didn’t do much more than make noise, but by golly, they were skates, and she wanted to try them, so try them they did. I talked with the dad for a little bit, asking if it was okay if I shoot, and when he said yes, I walked across the parking lot and started shooting with my 300 – that way I wouldn’t interfere with what was happening, and the pictures were more spontaneous. I knew, just knew she was going to fall – and was just waiting when she did, just like her dad was – and we both caught her at the same time. Look again – does she see her father? No – there’s nothing she can see – it’s all trust – believing that he’ll do what he said he would do. That trust is a very valuable thing. Knowing that “Daddy’s going to be there…” is an amazing thing – both from our earthly fathers – daddies – to our Heavenly Father. 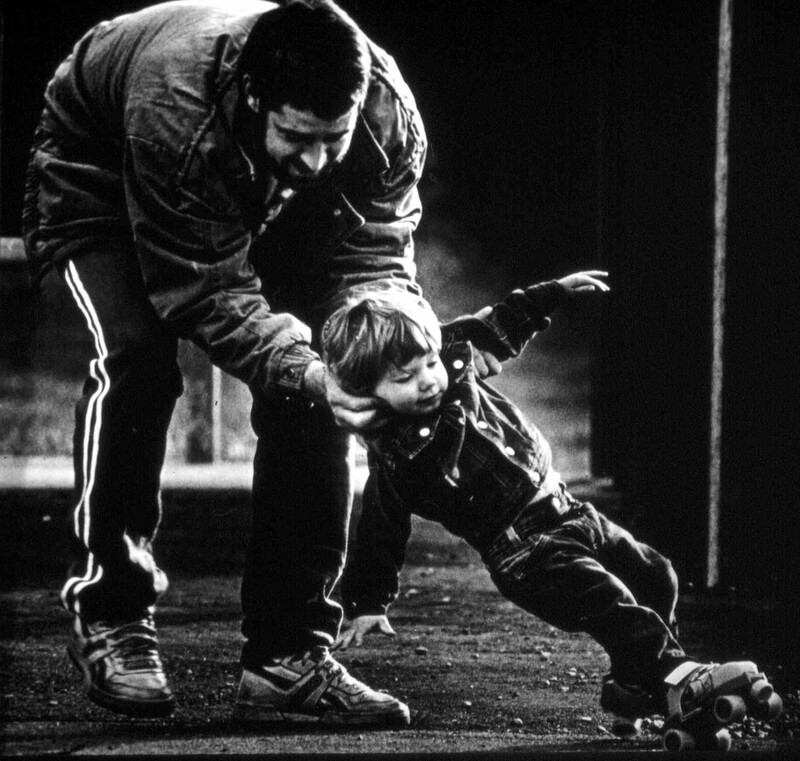 If you know – really know that your Father is going to be there, you will have trust – and therefore, no fear. I also learned that daddies taking the time to take their little girls to the park is just way, way past cool. Knowing Daddy's arms are there makes all the difference. Had surgery Monday to get a steel rod shoved into my femur. Am a little tired today. Seems to be a bit hard on the family – these events with me either having things put into my body or taken out. Regardless of why – the pain is always there, and right now, as I write this – it hurts. I’m going to try to slap my head on a pillow and konk out. Anything I wrote today (including this) would be written under the influence of some pretty powerful pain killers. So that said, – I’ll sign off now and try to write something tomorrow. It was in “Athens-by-God-Ohio” that I met her, the feistiest, orneriest, funniest little old lady (short of my mom) I could ever hope to meet. Cleo was 88, and I was there in Grad school a number of years ago, getting my master’s degree in photojournalism – and I was there without a car. This limited the stories I could do to pretty much walking or busing distance, and I found that Cleo lived just down the street. Cleo was as independent as they come, and lived alone, in her own house. She did her own grocery shopping, did her own chores, and spent occasional afternoons at the senior center in town playing cards or just reminiscing with the dwindling group of friends her own age she could relate to. Her kids thought she was too old to live by herself, so they decided that she needed to be moved into a nursing home. She disagreed, but it seemed that they were pretty insistent, and they moved her there. Well, she promptly hopped a Greyhound back to Athens. They didn’t mess with her anymore after that. In talking to her, I found that she did her chores on Saturday, and since I was trying to find a story – I thought that it would be interesting to see what kinds of stories could be told in the pictures I could get of her doing that – so I made an appointment with her for Saturday morning around 10:00. After we talked and joked a little, I told her that her job was to ignore me, and to just do what she would normally do. Now when she mopped, she put on these old floppy galoshes, grabbed a bucket of water and whatever cleaner she used, and sloshed water on the floor and mopped it up. There was no grace to the movements, no pretense. She wasn’t putting on a show for me, in fact, she was in her own little world, and completely ignoring me, which was just perfect. I took some pictures of the mop and the galoshes, thinking that would make a good detail shot, and then, as I was focusing, she picked up the bucket and started for the back door. I followed, getting a shot of her opening the old, dilapidated screen door, and at that moment, the light came on in my head – she was going to throw the water off the back porch! I literally jumped past her as she hung the mop onto a string, spinning 180 degrees in mid air so I landed facing her somewhere in the middle of the little back yard. I must have instinctively focused the lens (a 24mm Nikkor) somewhere in mid air because I don’t remember doing it. 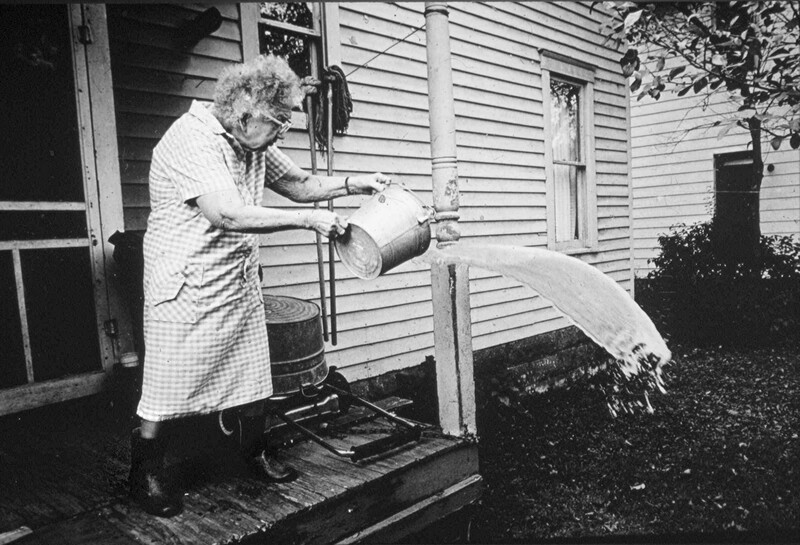 I hammered down on the shutter release for the motor drive of my Nikon FM-2 just as she did her back swing to lob the water off the porch, and got a series of 5 shots of the water sloshing out of the bucket into the yard. Number 3 was the best. 1/250th of a second at f/8. It wasn’t an easy print. I printed it as high contrast as I could get – but that meant that the highlights (specifically her right arm, where the sleeve ends and the arm begins) were blasted out pure white and needed to be burned down so you could see detail. I dodged out the galoshes, making sure you could see them, and used a touch of potassium ferricyanide on the wet mop hanging on the string to make it less of a blob. I burned the wall of her house down a little darker (photographically, not in real life) so it would fade into the background a little, bringing the water up a bit in the process. She was 88 years old back in 1987, so I’m sure she’s gone now, but she was a neat lady. I’m glad to have known her. Many years ago, my mom and dad decided they wanted a fish pond in the back yard. Now since fish ponds aren’t something you can just get at the local hardware store, it had to be “assembled” and “installed”. Now installing a fish pond involves removing a lot of dirt out from where the fish pond is about to be, and it is definitely one of those things that involves sweat equity. By the time you’re done, those fish better dang well be happy they’re there, because it took a lot of work to get them there. She’d done a good bit, if not all of the work to do the installation – and had a vested interest in keeping those fish alive. On the flip side of things, while gold fish aren’t really all that expensive, the idea of something taking the fish that, say, hadn’t earned the fish with that sweat equity, that just – well – it irritated mom. And one day, a poor, unfortunate creature made the incredibly bad decision to go fishing. Now some of the creatures that had gone fishing in mom’s fish pond were raccoons, and they were moderately successful. Some of the creatures were neighborhood cats, who just couldn’t seem to ignore the little orange – what would you call them, “containers of food”? – swimming around in there. Note – the image you have in your mind of these creatures fishing does not involve little raccoons or kitty cats sitting there in little kitty sized chairs, with kitty or raccoon sized fishing poles, waiting for the little fishies to bite. They got a little more intimately involved than that, and got very close to the water, and then just scooped the fish out with their claws. Kind of like combing some grunk out of your hair, only instead of hair, it was water, and instead of grunk it was a fish. This day the creature was running a little short on claws, and actually, a little short on fur. See, one of the creatures that apparently liked hanging around mom’s fish pond watching said fish was a fairly large garter snake. Now garter snakes aren’t poisonous, we used to play with them when we were kids, my cousin, bless her fuzzy little heart, would find baby ones and put them in her pocket, then come into the house with her hands full (note: her hands were ALWAYS full in these situations) and ask her mom, “Mommy, can you get the dime out of my pocket?” (it didn’t matter what she asked for – the goal was to get her mom’s hands in her pocket.) Just so you know, her mom HATED snakes. Her mom reached into her pocket expecting to find a dime, and instead found something that gave her an absolutely astonishing case of the heebie jeebies as she found, with her fingers, an itty bitty snake. The polite thing to say here at this point is that my cousin laughed. It’s one of those things you can look back on and laugh. Well, my cousin can, not sure if my aunt can. And that’s the kind of stuff we did as kids with garter snakes. And it most definitely upset mom. That was HER fish, from HER pond, and no dang snake was going to take that fish from her without a fight. So she did the first thing she knew she needed to do. She got her camera, and took a picture – just to prove she wasn’t telling a “fish tale”. Then she got the pitchfork – mom’s goal was to scoop the snake up and fling it away from the fish pond. Got goldfish out of snake and back in water…. In progress. See, it was only then, after she’d gotten a picture of it that she realized scooping said snake up was not going to work, and the snake made what might have been a bit of a mistake somewhere in there. The snake needed to go. But the snake didn’t go, and then it looked up at her, and then, suddenly, thousands of years of history of women and snakes converged into one moment in time. I’m sure that if Eve had had the same pitchfork Mom did, the whole Garden of Eden thing would have been a WHOLE lot different. Mom started absolutely wailing on that snake as if it was the son of Beelzebub himself. (Come to think of it…J). This snake did not know what hit it. In fact this snake didn’t know what KEPT hitting it, but it most definitely let go of the fish. Mom tossed the fish back into the pond, then grabbed the snake by the tail. It was as long as from her waist to the ground. It then made the mistake of looking up at her – with goldfish scales in its mouth – and it hissed. And the pitchfork was used, once again, for a purpose for which it was not designed, but was quite suitable for. 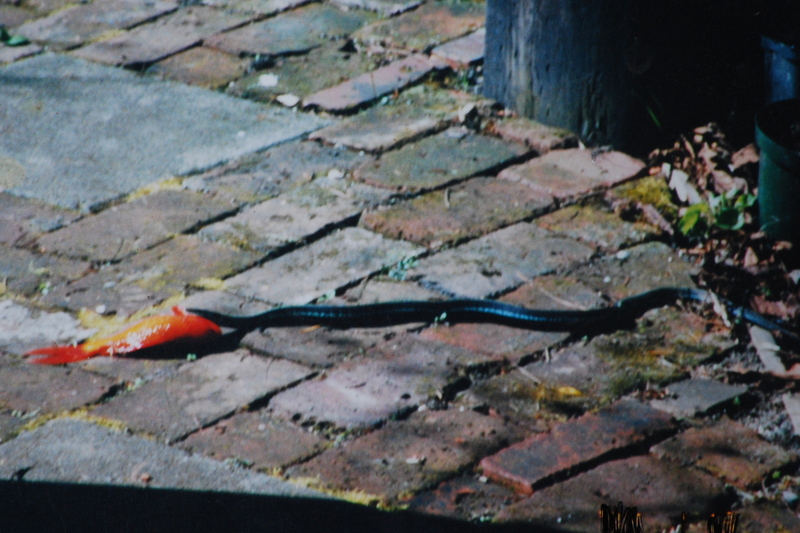 The snake, by that point, was getting to be pretty ambivalent about the whole thing. In fact, with apologies to Johnny Hart, trying to slither with 432 slipped disks was a bit of a challenge, and it was then that she carried it a few hundred feet away – across a little creek, and hucked the snake over there like Indiana Jones would have flung his whip. So my neighbor walks up to the fence and his jaw drops. There I am, kneeling in the driveway, a Swiss army knife by my side, jumper cables in my hands, one end hooked to the battery of my 41 year old car, and the other end hooked to mother of all bottle rockets wired up, ready to go.